Massive abuses of European funds are now Bulgarian mafia’s main activity; OLAF does not care. The mayor of Vidin, a deputy prime minister and a parliamentary assistant among commissioners? Money from European projects, won by consultants through manipulations, is swiftly moving to a company with offshore ownership. Cash is coming back to the consultants through a person associated with Russian oligarchs. The cash is used to oil and propel the engine of a large-scale corruption scheme – a slush fund to pay commissions to politicians and officials. The mechanism of this powerful corruption machine was described in a publication by Bivol from September 10. Our investigation reveals an impressive number of rigged projects, securing winning bids for certain companies by placing trusted persons in committees under the Public Procurement Act (PPA). Once the project has been won, the money is being syphoned through fictitious deliveries, increasing many times construction works costs – up to 400%, according to some sources, and through other tricks. Politicians and officials provide a cover-up for the criminal scheme for which they receive bribes called “commissions” that have apparently been agreed before the project has been won. The lion’s share of the profits, however, goes to bank accounts in offshore destinations. The scheme is currently still underway, while its target is the European Union (EU) operational programs for the period up to 2020. The investigation by Bivol is based on secret documents we have uncovered (see otchet-general in Bulgarian). The database contains evidence of secret accounting books with respective revenue, expenditure and commissions columns for a period of 14 months – November 2013 – February 2015. During this period, consultants have worked on about 90 projects with European funding. The main players among these consultants are identified in the accounting books by their diminutive first names (or by nicknames): Tanya, Peter, Lily and Tedi. In other documents, however, they appear with their full names: Tatyana Delibasheva, Peter Elen Petrov, Lilyana Zorteva and Teodora Treneva. These data are also confirmed by the project documentation that is public, as well as by apparent and hidden connections between the persons involved in the scheme. Those unknown to the public people are not and cannot be the top of the “food pyramid” that syphons the money of European taxpayers. The documents, which Bivol continues to examine, lead to the company “GP Group”, which is associated with the boss of “Lukoil Bulgaria” Valentin Zlatev, as well as with Russian oligarchs with business in Bulgaria. One of the schemes detected by Bivol in those documents involves the supply of equipment and machinery. The main supplier of European projects under the Rural Development Program (RDP), won by the consultants and listed as “GP” projects, turns out to be a company with a hidden owner – “ESB – Sofia“. It is formally owned by a British company whose listed owner is a British citizen living in Cyprus. It is obvious that he is a strawman because hundreds of companies are registered in his name. All this is used to circumvent new Bulgarian legislation, mandating to disclose the real owners as everything is formally in EU jurisdictions. The cash flows from European funds to companies established by members of the group go first through the consultants and then to the offshore, reveal bank statements that Bivol has in its possession. The main activity of the “ESB” is the import of construction machinery. Its portfolio is serious. “It was founded in 1994 in Sofia as a joint venture of the “Brno Power Plant” in the Czech Republic and Bulgarian individuals,” the site of the company informs. It presents itself as a specialized supplier of construction equipment and steel pipes. It is not a shell company. It declares solid revenue from sales – 28 million in 2017 and provides benefits to 24 workers at the moment. Who are the Bulgarian individuals? Until 2009, the owners of the “ESB” were Boris Krumov Stoyanov and Silviya Borisova Stoyanova-Videnova. They have sold their shares to the offshore “Allegra Asset Limited”, after which the ownership has changed two more times through different offshores to land in the hands of the Brit with the many companies, living in Cyprus. Silviya’s husband Ivo Lyubomirov Videnov has been in the past in the board of directors of the Thermal Power Plant (TPP) “Maritsa East 2”. However, it is clear from the documents that “ESB” is involved in all kinds of supplies – including construction and assembly works for the projects. Another supplier appearing many times on the invoices and bank statements is the company “Silkopi”, whose owner is the same Silviya Stoyanova. Example: On December 4, 2014, the consultancy company “Lian Consult” received a transfer of BGN 119,000 from the Association “Marshruti (Routes) BG”, which is managed by Peter Elen Petrov’s girlfriend – Simona Dacheva. The money is for a European project under the RDP, for which “Lian” is the consultant. Immediately, on the same day, “Lian” made a transfer to “ESB-Sofia” for BGN 110,000. “ESB-Sofia” has also supplied a packaging machine for “Michel Advice”, which has won a European project under the Competitiveness program for co-financing with BGN 1.9 million. It is owned by Boyko Yordanov Ivanov, one of the important persons in the group (see below). According to the available documents, the offshore company is also a supplier to “Glavbolgarstroy”. It is obviously key to the implementation of the schemes to syphon European funds, and a simple onetime check into the bank accounts will prove it. “ESB-Sofia” has no formal connection with the group of consultancy firms. But it is hardly a coincidence that it shares with “Lian Consult Services” four employees who, as Bivol has already written, are a key part of the scheme for manipulating public procurement – deployment of “independent” experts in committees ranking the bidders to absorb European money through projects. The former employees of both companies are Zornitsa Boshnakova, Dobri Kondov (a former employee of the Road Infrastructure Agency, RIA), Svetoslav Pavlov and Gergana Valkova. Boyko Yordanov Ivanov, owner of “Alfa Pak”, is a former employee of the Sofia City Hall and the SFA. Boyko Ivanov and Lilyana “Lily” Zorteva actually live together (cohabit) as a family. He left the SFA after a scandal with a public procurement for BGN 20 million for the municipality of the village of Satovcha, but while he had been there, he had been involved in many projects with RDP financing, linked to the group and described in our previous story on the topic. In the “Commissions” column, he appears as “Boyko from Lian”. Boyka Lyubenova Ivanova is the mother of Boyko Ivanov and manager of “Alfa Advice”, one of the many secondary suppliers of consulting services for the projects. Attorney Ivan Sergeev Doynov spends his work hours between “Lian Consult” and the Ministry of Environment and Waters (MEWs) and has previously worked for the RIA. He also appears as an “independent” expert in many projects. These employment data were reviewed by Bivol in the short period of time when, due to a technical blunder, the website of the National Social Security Institute (NSSI) could be freely screened for each person’s benefits’ status without introducing a personal code. In the “Salaries” column of the consultants’ secret accounting books, these people appear with their first or diminutive names: Geri, Dobri, Svetlio, Anita, Ivan, and so on. Commissions and salaries for March 2015. Click to enlarge. This column also lists a person named Salzitsa, and her salary is the highest. This is Salzitsa Arnaudova, owner of “Interproconsult”, who is also the manager of “Lian Investment Limited”- a major force behind many of the EU-funded projects won by “GP Group”. Anita Dimitrova Kotova (maiden name Draganova) is a surveyor and also an “independent” expert, and in some of the PPA committees, she appears together with Dobri Kondov. She is the wife of the long-time employee of “GP Group”, Raycho Boykov Kotov, who has also been an employee of “Lian Consult Services”. Right now, attorney Kotov is a key expert in a number of projects funded under the Operational Program Environment (OPE) (see here). He is the person listed as “Raycho”, who receives regular commissions from the group. So far, we have not received any replies to questions sent to the addresses of the companies associated with the consultants. A number of cars, RVs and ATVs have been purchased with European money, our investigation established. The amounts are small against the backdrop of the millions syphoned from other projects, but the insolence and sense of impunity of those masterminding the schemes are indicative. One of the “Alfa Advice” deliveries, approved by the SFA, is for two Nissans “Navarra” for BGN 139,800, two “Hymer” RVs for BGN 264,600 and an ATV for BGN 96,000, all financed under the RDP by the SFA. The beneficiary is the company of Zorteva’s younger brother, who had been only 19 years old at that time. On top of that, the “consultant” has collected another BGN 25,020 from the European taxpayer’s pocket to recommend suitable vehicles and to prepare a business plan for the development of rural business: “Recreation in Nature through Alternative Forms of Tourism”. In another similar project, “Tanya Stoyanova Vateva” has bought through “Alfa Advice” eight Toyotas RAV 4 from the company “Paragraph SH”. The company’s owner is the daughter of Maya Hristova from the company “MM”. The cars are insured in “MM” for BGN 11,780 per year with a “Casco Premium” policy, according to bank documents, which Bivol has examined. The project’s consultant is “Rila Consult”, which has collected a nice amount of BGN 23,000 to prepare a business plan for extreme tourism with SUVs. Maya Hristova is known for being close to “popular investor” Ginka Varbakova, who privatized the power utility CEZ through her company “Inercom”. Half a year ago, our investigation into the relationship between Maya and Ginka led to persons from Prime Minister Boyko Borisov’s most inner circle (here). Media publications identify her as “the Maya from “half of Sofia knew about Maya” from #Yaneva Gate and the story about the Prime Minister’s love affairs, told by Judge Vladimira Yaneva. The money for the SUVs is taken from the European taxpayer pocket for “Integrated Tourism, through the Organization of Extreme Mountain Treks in the Rhodope Region”. The project has passed all SFA checks and is accounted for in documents. However, it is clear from Vateva’s financial statements that real tourist activity is unlikely to have occurred because the turnovers for the reporting months are around zero. One can conclude that the vehicles had not been taken at all on the extreme Rhodope black roads. After the expiration of the deadline, they had been simply sold, again through “MM”, according to an insider source. This fact is readily verifiable by the investigating authorities through the VIN numbers of the eight Toyotas. Such “fake” EU projects have been won by Peter Elen Petrov’s girlfriend – Simona Dacheva, who engages in rural tourism in the town of Etropole with four Dacia “Duster”, bought with European money. Her partner and “independent” expert Gergana Valkova has done the same with a similar project in the town of Radomir. She takes lovers of the Radomir nature on rides with a Toyota Hilux pickup truck with license plate PK2848BM and with a RAV4. We learned that the Dacia and the Toyotas are in reality used as service cars by the consultants and “GP”. The operative information is that the cars can be regularly seen in the parking garages of the building on 59A “Cherni Vrah” Boulevard and that one of the Dacia bought with European money had been even used to load and transport the documents and evidence of abuse of European financing to be set on fire near the village of Egulnitsa, close to the town of Radomir, where Bivol’s team was arrested while investigating the crime scene. Perhaps the most scandalous entries in the “Commissions” column in the secret accounting books are the two ones from February 2015 – MEWs deputy – 32,812 and Deputy MEWs – 32,810. Probably they are for one same payment to a MEWs Deputy Minister. At this moment, the MEWs had three deputy ministers. One of them is particularly recognizable because of his last name – Zhivkov – as he is a relative of Bulgaria’s Communist dictator Todor Zhivkov’s and is from the dictator’s native town of Pravets. His name is Krassimir Zhivkov. He has been Mayor of Pravets twice, and during the first term of Boyko Borisov’s government was also Regional Governor of Sofia. As such, Zhivkov was exposed by the National Audit Office in serious violations of the Public Procurement Act. He is publicly and media popular as a close protégé of Valentin Zlatev and has business and property relations with people from Zlatev’s inner circle. Currently, however, we do not have enough information to identify him as the corrupt deputy minister from the MEWs. On the other hand, commissions for the project in the northwestern Danube city of Vidin “Implementation of External Technical Assistance to Assist the Municipality of Vidin in the Implementation and Management of Project “Rehabilitation and Extension of the Water Supply and Sewerage Systems in Vidin, Bulgaria” worth BGN 497,000 is readily explicable. The project has been contracted by the Vidin City Hall and it is fully financed by the funding body – MEWs. As such, it is precisely the MEWs that secures the approval of a contractor and the follow-up oversight, which explains the listed hefty commissions to the deputy minister. According to the association “Boetz” (Fighter), commissions for the project had been received by the Mayor of Vidin at that time – Gergo Gergov. The respective entries are – Mayor Vn. – 45,000 in December 2013, Mayor Vn. 16,185 in March 2014, Vn – km – 35,000 in April 2014, Vidin -k – 10,000 in September 2014. Bivol was unable to confirm this information in the electronic documents at its disposal. Apart from Mayor Vn., one can also find in the accounting books Vn Stanislava – Vidin Audit – 5,200 in December 2013, Stanislava – Vidin mng – 9,920 in December 2013, Stanislava Vn – 5,705 in March 2014, Stanislava audit Vn – 7,750 in April 2014, Stanislava tech assist – 13,520 in April 2014, Stanislava Vn – 8,000 in July 2014. Stanislava from the Excel table does not receive money for just Vidin. In May 2014, we have Stanislava MEWs writing procedures with a commission fee of BGN 6,000. In September 2014, 23,705 were given to Stanislava MEWs climate and diffusers, and in December – another 10,000 to Stanislava, audit MEWs. The only person matching, both, the name and the job description is Stanislava Yotova-Hristova, who at that time worked at the MEWs and simultaneously worked as a manager of the project for the Vidin Municipality and the latter was paying her a wage. There is a connection with “Rila Consult” as well. Until 2011, Stanislava Yotova-Hristova worked at “Euro Engineering Consulting” and in 2013 she was involved in the Consortium between “Vial Consulting” and “Rila Consult”. Currently, Stanislava Yotova is Head of Public Procurement at the Ministry of Agriculture. Previously, she has held the same position in the SFA. Apparently, she is quite valuable for Rumen Porozhanov (former head of the SFA and current Minister of Agriculture – editor’s note) as he is taking her with him from institution to institution. Stanislava Yotova is also a parliamentary assistant for the EU funds of the DPS MP Imren Ismetova Mehmedova. Yotova is an active traveler, as seen from her Facebook profile, where she is showcasing herself in Venice and other exotic locations with friends, including Sadife Mehmedova, the daughter of the DPS leader in the city of Targovishte and Head of the Registrar Judges at the Sofia Regional Court. Our attempt to get in touch with Yotova at her workplace was unsuccessful. The Director was busy and did not return a call to the phone number left with her secretary. Other suspects on the list of commissioners include Lacho, Yanaki and Ivo. Without implying whatsoever that any of them had received commissions, these first/diminutive names match Lachezar Zolev, a former SFA expert who is now chief auditor, Yanaki Chervenyakov – an expert at the SFA, and Ivaylo Stoyanov – a former employee of the Public Procurement Agency (PPA) who is now writing articles in the ZOP Plus magazine, a specialized publication focusing on public procurement. Bivol also made an effort to identify the individual named Tedi, depositing huge amounts of cash, according to the consultants’ secret accounting books. The only possibility is actually a lady – Teodora Simeonova Treneva-Shopova. She has an accounting business and is the manager of the company that owns the wine cellar and the hotel to it in the village of Starosel. A check at the NSSI showed that Tatyana Delibasheva – Tanya has been an employee of the company “Reliance” of Teodora Treneva – Tedi, while Teodora Treneva worked at “Rila Consult” in 2013. There is, however, a clear connection between Tedi and Tanya, Petar and Lily. Nikolay Shopov – the listed on-paper owner of “Rila Consult” – is a proxy of Treneva-Shopova in the company “Balkantobacco”, the owner of the “Starosel” wine cellar and hotel (also funded with EU money). They are probably a family because Shopov is the founder and former owner of “Reliance”. He has later appointed Teodora Treneva-Shopova as manager, and after that, transferred all of the company’s shares to her. Precisely with this company, Treneva-Shopova is in the “Consortium New Home” with Tatyana Delibasheva and “Europrogramconsult”. Angel Kostadinov Angelov is listed as the owner of “Balkantabacco” through the Cypriot offshore Penigel Trading. According to Bivol’s research, the “Starosel’s” ownership is related to the same Russian oligarchs who built Mall “Paradise” in Sofia. They are Roland Isaev and Paata Gamgoneishvili, Russian billionaires who have a big business with shopping centers in Russia. Lukoil’s former head, Ralif Safin, is a partner in one of their projects. Gamgoneishvili and Isaev, along with other Russian partners, launched their business in Bulgaria by acquiring the commodity bazaar in the Sofia “Ilientsi” district, which was previously controlled by one of the two largest alleged organized crime groups in Bulgaria in the 1990s – VIS-2. Both have acquired Bulgarian citizenship. Earlier this year, Paata Gamgoneishvili’s name appeared in the list of creditors of Ginka Varbakova’s “Inercom” that bought the Bulgarian business of CEZ. The list leaked by a Czech official and was taken by Prime Minister Boyko Borisov to the secret section of Parliament, from where it quickly made Bulgarian media headlines and front pages. The manager of the Bulgarian business of the Russians is David Koblianidze. His daughter, Ketevan, controls “Myriad MK”, which also owns “Magna MK”, the investor company in the controversial skyscraper project near Mall “Paradise”. GP Group, Lukoil of Zlatev and… Taki? As Bivol already wrote, “GP” is identified in the consultants’ files as the beneficiary of much of their projects. In addition, their employees appear as “external” experts in committees under the PPA and eliminate the competition in projects worth tens of millions, won by… “GP Group”. Besides the shared address on 59A “Cherni Vrah” Boulevard in Sofia and the many projects with joint participation, the connection of the consultants with “GP Group” is confirmed by the activities of Raycho and Salzitsa, and of attorney Lilyana Zoretva. “GP Group” publicly denies any connection with the scheme. In a previous investigation, we also uncovered the links of “GP Group” with Lukoil Bulgaria, which involves the offshore “PI”. Between “PI” and “GP Group” on the one hand, and “PI” and “Lukoil” on the other, there are many real estate deals, raising suspicions of money laundering and drain of Lukoil through inflated prices for terrains to build gas stations. One of the consultants – Petar Elen Petrov – has been part of this scheme as well. His company, “Alfa Build Engineering”, bought a property from “Finance Invest Group” in the town of Petrich for BGN 1,481,653 on November 11, 2016 and resold it to Lukoil Bulgaria for BGN 2,061,992 just a few days later – on December 16, 2016, while “Finance Invest Group”, itself, had acquired the property for only about BGN 400,000 earlier in the same year. The final price is five times higher than the original one and the money has been paid by Lukoil. “Finance Invest” is a sole proprietorship of attorney Velizar Radev, who represents the offshore company behind “PI” and is connected with the owners of “GP Group” in many companies. This real estate deal in Petrich confirms the close intertwining of “GP Group” with the consultants on the one hand and Lukoil on the other. Petrov’s “Alfa Build Engineering” emerges in the Black Sea city of Burgas as a competitor of “GP Group” for a public procurement worth BGN 13.7 million for the construction of a sports center. The difference in their ranking is a tenth of a point, but “GP Group” has not appealed the procedure. And as one can see – there was no need, the connection between the two companies is obvious and the public procurement was actually a one-horse race. According to Capital daily, this tender is one of those suspended by Prime Minister Borisov in 2016, when he alone stopped the big tenders for the “Hemus” highway, won by “GP Group” and “Vodstroy 98”, allegedly associated with the controversial lawmaker and media mogul Delyan Peevski. Moreover, as noted in numerous media publications, “GP Group” builds, both, the Lukoil gas stations and the RUI hotels owned by Valentin Zlatev’s father. On behalf of Valentin Zlatev, Lukoil Bulgaria denied any association with “GP Group”. Here, we cannot ignore the fact that the term “in all legitimate ways”, which is commonly used in such cases, has been replaced by another and vaguer one – “in all possible ways,” implying a completely different message to Bivol’s journalists. Possible ways in no way overlap with the legitimate ones, and this sentence from Zlatev’s statement is a giveaway approach and can be interpreted as a straightforward warning or even a threat. If he wants to do the right thing, Mr Zlatev should specify what exactly he means when he uses the word “possible”. An interesting fact is that Velizar Radev from “PI”, serving as a real estate agent of Lukoil, is associated with Boryana Shehtova, believed to be the wife of the alleged drug trafficker and underground boss Hristoforos “Taki” Amanatidis. Through her, Taki is also a sort of relative of one of the owners of “GP Group” – Georgi Vassilev, who is married to Anna – Boryana Shechtova’s twin sister. In addition, Radev is the manager of Shehtova’s company “Lyulin Properties”. He has registered and then has sold to Shehtova the companies “Pro Dial” and “Bulgaria Building”. Another company directly linking Shehtova with “GP Group” is “Markovo Tepe” Mall. In it, she is co-owner with the owners of “GP Group” – Vladimir Jitenski and Georgi Vassilev. In addition, this company is also registered on 59A “Cherni Vrah” Boulevard. There are a number of reports that Amanatidis is currently in Dubai, where he often spends time in the company of Delyan Peevski. The scale of the scheme outlined above is such that hardly any political faction since Bulgaria’s EU accession and the granting of EU funds has been left out of the corrupt cash flows. For this reason, in the days following our first publication, no law enforcement activity was noticed. The Prosecutor’s Office “woke up” and launched a probe seven days later, on September 17. According to its announcement, all of the projects with the participation of the companies in question will be probed and the investigation will be assigned to the National Security Agency (DANS). The DANS agents have a lot on their hands. To reduce their workload, we publish a file with the projects for the period 2007 – 2013, in which the said consultants have participated – a total of 88 projects, most of them are of “Rila Consult”. After deduction of expenses, including the bribes, these projects have brought half a million to Taniya, Petar and Lily. Separately, however, there are many projects that have been won by individuals connected with Petar, Lily, Tanya and Tedi. In addition, the companies remain active in EU projects that are expected to receive large financing, and possibly – respective commissions. “Rila Consult” is a consultant in numerous projects from the current Operational Programs period, as is clear from the Information System for Management and Monitoring of EU funds in Bulgaria 2020. “M Consult Services” is extremely active in the building rehabilitation financed with EU funds. It increases the buildings’ energy efficiency in 20 projects. In the rehabilitation works, the well-known “Alfa Build Engineering” of Petar Elen Petrov has already won nearly 13 million from public procurement, mainly in municipalities managed by the ruling party Citizens for European Development of Bulgaria (GERB), in addition to the sports center in Burgas for nearly the same amount. Example: For just four projects under the RDP for adult day care centers, the consultants have reported a subsidy of BGN 3.7 million, real costs in the amount BGN 2.1 million and a “profit” of BGN 1.6 million. The profit, in this case, is simply theft of EU funds through inflated costs. Using these schemes, we can calculate roughly the amounts syphoned by contractors under the so-called “Hard Projects”, in which hundreds of millions of euros are absorbed mainly for construction and infrastructure works. There, “GP Group” works mainly through subcontractors who do all the real work, but receive significantly less money than the absorbed and reported to the funding body. There are huge deficiencies in the quality, the materials used and the sustainability of the sites. An independent probe can very easily identify the exact dimensions of this practice of huge abuses of European funds. Unfortunately, OLAF, the European institution responsible for protecting European taxpayers’ money, has proved to be totally ineffective. What is more, we can infer from our previous experience with the European white-collars working for this watchdog that they are not particularly enthusiastic, even in cases where evidence of theft of EU funds is readily provided to them. Brussels has quickly adapted to the high levels of corruption in Bulgaria and even gives the impression that the local corruption system is quite convenient for the high-ranking bureaucrats in the European Commission. Unfortunately, despite the tipoffs dating as early as September 11 and the Prime Minister’s orders to the Ministry of the Interior to launch a probe, a large number of documents from the offices of the companies participating in the scheme were destroyed. All of them were in the “GP Group” building on 59A “Cherni Vrah” Boulevard but were urgently moved to another location. The Bulgarian media also ignored the subject until Friday, September 14. The previous evening, journalists Dimitar Stoyanov of Bivol and Attila Biro of our partner media – Raise Romania – were arrested by the police, handcuffed, and prevented from making phone calls for six hours. They were released at dawn on September 14, after the Romanian Consul intervened. All this happened in the vicinity of the western town of Radomir while the journalists were attempting to salvage documents related to EU projects from being burned in a fire. The answer to why near Radomir is simple. The driver of one of the main players in the scheme, Tatyana Delibasheva, has a country house in the area. His relatives set the documents and some cell phones on fire in a pit in the middle of a field. They hardly knew the content of the sacks with shredded documents and files they had been throwing in the fire. “GP Group” denied removing and destroying documents, but Bivol has not made any such statement. As we revealed, the bids for the projects are being prepared by the consultancy companies of Petar Elen Petrov (Petar), Tatyana Delibasheva (Tanya) and Lilyana Zorteva (Lily). It is from these companies, which have offices on 59A “Cherni Vrah” Boulevard that the documentation has been removed and a large part of it has been destroyed. The scheme of Peter, Tanya, Lily and Tedi has been running like a well-oiled machine for years and even at the moment, but apart from the identified consultancy firms, there are many connected suppliers to which project funds are directed, invoiced at inflated prices or invoices for fake supplies are issued. These schemes have also been detected by the National Revenue Agency (NRA), which has carried out some inspections, but it is unclear whether they have ended with evidence of abuses. Eventually, the prosecution tasked DANS with an investigation. The last time when DANS launched a probe because of an investigation into the abuse of EU funds by Bivol, its agents raided the SFA. Bivol had revealed then that the employee of the SFA, Yanaki Chervenyakov had been living a lavish lifestyle and that his mother-in-law had received funding for a guesthouse that is being used as a private vacation home. Three years later, DANS is yet to find anything, no charges have been pressed, and Yanaki Chervenyakov, who had been dismissed, was reinstated in the SFA. By the way, let’s recall that the list of commissioners includes the first name “Yanaki”, but there is no confirmation that it is the same person. 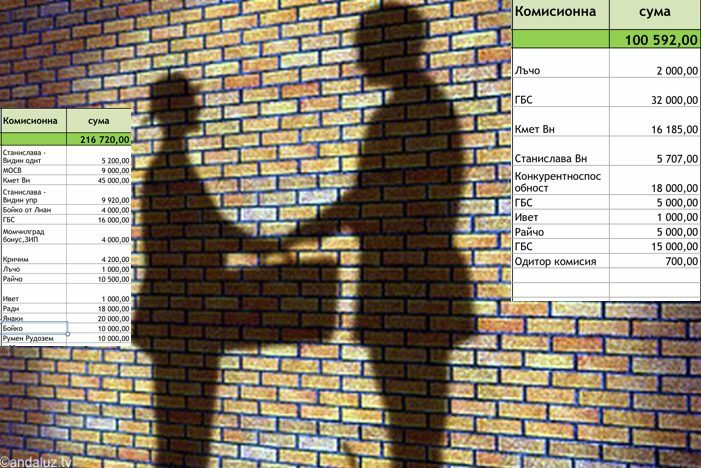 Bivol’s opinion is that such a huge scheme of theft of EU funds, entangling in corrupt dependencies large businesses, officials, political figures and Russian oligarchs, cannot be unraveled by the Bulgarian law enforcement authorities because of their overpowering association and dependencies regarding the individuals that will be potentially investigated! It is logical to expect further destruction of evidence. The outrage with the burned documents is proof of this. That is why we initiated a petition to the European institutions asking for the investigation to be conducted by foreign law enforcement and services and to freeze all EU funds for Bulgaria until its final outcome. The investigation is part of the project “Exposing fraud in EU-funded projects in Romania and Bulgaria” by Bivol and Rise Romania funded by the European Commission’s IJ4EU Fund and the European Centre for Press and Media Freedom (ECPMF).